Washington, D.C., October 13, 2009 –The Washington International Horse Show (WIHS), a leading national equestrian event based in Washington, D.C., since 1958, is pleased to present Washington's World of the Horse, a new family-friendly event celebrating horses in all their beauty and variety. World of the Horse will be held Sunday, October 25, 2009, at 1:00 P.M. at Verizon Center. Tickets are $15 and children 12 and under are free. Washington's World of the Horse will include more than 12 different equestrian acts showcasing dressage, barrel racing, Saddlebreds, Friesians, sidesaddle, reining, jumping, polo, the U.S. Park Police Mounted Patrol, plus the show’s famed terrier racing, and more. "World of the Horse is both an educational event and lots of fun," said Anthony Hitchcock, WIHS Chief Oerating Officer. "It's 90 minutes of fast-paced family entertainment. Participants come from as far away as Canada and as near as Beallsville, Md. The local Washington, D.C., community has some of the finest horses and riders in the country and we're delighted to welcome them to World of the Horse." The first 1,000 spectators will receive a poster from Animal Planet and a special Kid’s Day edition of The Equiery (one per family). WIHS corporate sponsor Comcast is sponsoring complimentary general admission for all children 12 & under at all WIHS performances before 5:00 P.M., including World of the Horse. Tickets are available at Ticketmaster.com and at the Verizon Center box office. Discounts are available for groups, military, seniors, students and Comcast employees. The 51st WIHS will be held Oct. 20-25, 2009, at Verizon Center in Washington, D.C.
An equestrian tradition since 1958, the Washington International Horse Show brings horses and riders of all ages, including Olympic champions from all over the world, to the nation's capital for thrilling jumping competition and a chance to compete for more than $400,000 in prize money and championship titles. About 500 horses participate in show jumping, hunters, equitation and dressage events during the six-day show. Special exhibitions, shopping on the concourse and community and charity events round out this family-friendly show. Since its debut, the Washington International Horse Show has been a popular Washington, D.C., fixture visited by presidents, first ladies, celebrities, business and military leaders, as well as countless horse enthusiasts of all ages. 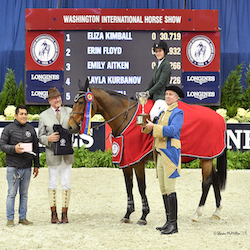 Washington International Horse Show Association, Ltd. is a 501(c)(3) charitable organization.